This tin metal sign depicts a Harley-Davidson motorcycle. It reads "Historic Route 66 Since 1926. Mother Road Motorcycle Repair. Anytime Any Place We Come to You. USA." A great decoration for the garage, office or den of any Harley rider. It also makes a great gift for motorycle riders or enthusiasts of any age. This is a metal sign, made in the U.S.A. Measures 11.75 inches round. UPC: 6-05279-11697-3 | Part No. 1697. 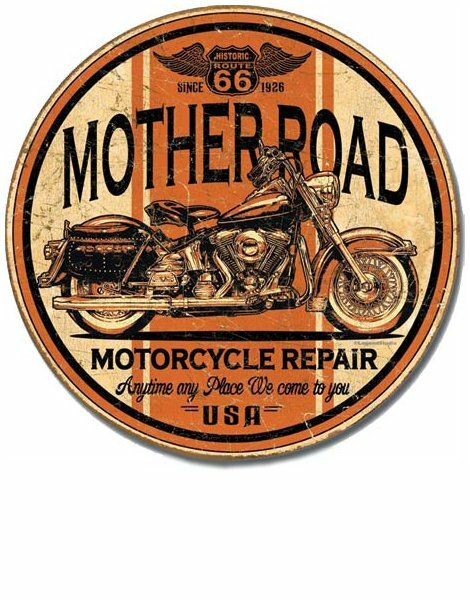 Ask a question about "Mother Road Motorcycle Repair" Tin Sign.